When people hear the word unicorn, they typically think of the mythical magical horse with a horn on its head. I'll allow that it's a reasonable assumption, since we only hear about the beasties in fantasy stories. So why did the King James Version of the Bible use the word unicorn? We're not confined to just the Bible referring to unicorns as real creatures. One of the constellations in the picture above is Monoceros, which is the Greek word for (wait for it...) unicorn. Somewhere around 1612, cartographer Petrus Plancius introduced this and seven other constellations on a celestial globe that was published in Amsterdam. The fantasy horsie and the historical one-horned creature were concepts that existed at the same time for a long time. Reckon that the historical creature of great strength is extinct now, so that's part of the confusion; the mythical scenario continues. No, God did not use mythical creatures in his Word. 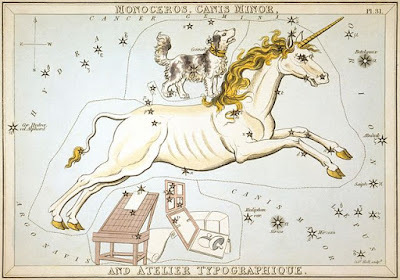 Unicorns mentioned in the Bible—not only in English King James Version but also in other languages—are not the fairy tale creatures many people think of nowadays, but real creatures familiar to the people living in those ancient times. So what kind of creature was the Bible talking about? If there really was a historical unicorn, when did the word start referring to a creature of fantasy? And why did Bible translators use a word that could dredge up fantasy images in documents intended to reflect genuine history? To read the entire article, click on "Will the Real Unicorn Please Stand Up?" You may also want to see "Mythical Critters and Scoffers".